The Westfalia Culture | Leading The AS/RS Industry - Westfalia Technologies, Inc. Since opening, Westfalia Technologies has been committed to providing warehousing solutions by earning the trust of our customers. Earning this trust is not only based on our solutions we provide but honoring the commitments we make. Westfalia was built on a set of core values: committed people and products that stand the test of time. These core values have led to the successful company Westfalia is today, and are further defined in our mission and vision statement, and commitments we make to each other, our customers, industry and planet. To deliver unparalleled warehousing solutions by earning the trust of our customers, understanding their business needs and honoring the commitments we make. We are committed to being a world leader in warehouse optimization. Our Company and our products will stand the test of time. Through warehouse optimization we will limit the negative environmental impact of industrialization. Trust is the largest part of what Westfalia was built on, the trust in our people and our products. Earning this trust is not only based on the solutions we provide, but also honoring the commitments we make to each other and our customers. Our business is about solving problems for customers and building successful relationships. Time and time again, our customers praise us for the job we do for them, and the value we add to their organization. These relationships are hard work and take a special group of people to help forge them. More importantly, they define our reputation in the industry. 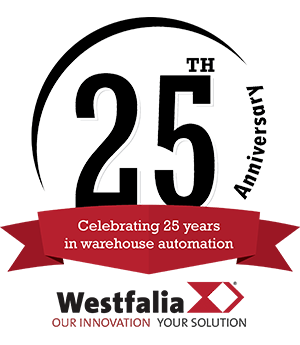 It is because of each individual employee and customer that Westfalia has grown to what it is today, a leader in warehouse automation. The word ‘partnership’ is a key element within Westfalia’s culture. Through our commitment to our customers’ success, we are an active partner in every project stage: planning, design, manufacturing, installation, testing, training, commissioning and service. All of the hard work we put into each project is designed around meeting our customers specific business needs. We respect our customers and they do the same for us through open and honest communication, and providing the path for a solid reputation in the industry. Because of this, Westfalia is a key player in the automated materials handling industry. Through continuous improvements to our products and solutions, we are dedicated to being an industry leader in warehouse automation and will lead by example. The key phrase is ‘lead by example’. That means we execute well, and our report card is ultimately defined by our reputation in this industry. We are committed to reducing the negative environmental impact of industrialization through warehouse automation. Automated storage and retrieval systems (AS/RS’s) offer companies “green” benefits concerning land use, energy consumption and waste production. Automated warehouses require a smaller building footprint, which reduce square footage requirements and also usesless energy. We aim to build a strong, vibrant organizational culture that supports both the company and the customers. We understand the difference between those elements that should be subject to change and those that should be best left unchanged. Our vision is something that has stood the test of time since we first opened the doors to Westfalia. This vision illustrates the core ideology we want to embrace, and ensures that our company and products will stand the test of time.